MAY BE A LYNCHING IN INDIANA. People of Chesterton Aroused Over Will Tratebass' Murder. Valparaiso, Ind., Aug. 15 -- Special Telegram. The citizens of Chesterton were thrown into a fever of excitement over the murder of Will Tratebass, 20 years old, by Lon Powers, aged 25. They had been having some trouble over property, and yesterday came to blows. This morning they met in a blacksmith shop and renewed the quarrel, when Powers pulled his revolver, shooting Tratebass twice near the heart, killing him instantly. A large crowd of citizens gathered and talk of lynching was heard on all sides. The relatives of Tratebass were severe in their denunciations of the murderer, and soon a rope was secured and several joined the crowd armed with guns. Powers was taken into a justice's office and a guard was placed over him. Then Deputy Sheriff Green was called by telephone, and by strategy succeeded in getting Powers out of town. The road leading from Chesterton to this city was lined with armed men, who were bent on wreaking vengeance on the murderer. He was placed in jail here this noon. A report is current tonight that a mob will be organized to storm the jail. Powers lived with his grandmother at Chesterton, his parents living in Chicago. Powers claims that the trouble arose over the property of his grandmother, claiming that Tratebasses had for years tried to run him out of town. Citizens of Chesterton say that Powers is a victim of dime novels. This murder took place where De la Bella Salon and Spa and Spike and Buddy's Interior Design businesses are presently  located in the 300 block of South Calumet Road in Chesterton - across the street from Hopkins' Ace Hardware. LATER DEVELOPMENTS IN THE HISTORY OF THE POWERS AFFAIR. Alonzo Powers, the murderer of Wm. Tratebas had his preliminary hearing before Judge Parks Tuesday, and was held to await the action of the grand jury without bail. Coroner Coates rendered a verdict in the matter and found Powers guilty of murder and recommended that he be held to the grand jury. Judge Johnson is defending Powers, and the only claim so far made justifying the shooting is that of self-defense. It is not expected that this line will be followed in the trial of the case as the only escape for Powers is the insanity dodge. The Prosecuting attorney has been here several times since the shooting, and had with him a stenographer and a photographer to take evidence. The grand jury will probably take action next month, but when the case will come to trial is another question. The Prosecutor had quite a time with Mrs. Powers and Mrs. Johnson, when he attempted to have pictures taken of the Bee Hive, the house where Powers lived. They strenuously objected, and a constable was called to assist in preventing them obstructing the work. Prosecutor Heard also swore out a warrant for the arrest of the two women. Mrs. Powers takes the arrest of her grandson very hard, and her sympathies are entirely with him. Not since the West murder has the community been so shocked and stirred up, as it is now over the killing of Will Tratebas by Lon Powers. As the particulars begin to come in, the case looks blacker for the murderer, and all that can save his neck from the rope is for him to successfully play the insanity dodge. From a child up he has been a lazy, shiftless fellow, with just enough ambition to envy his industrious neighbors and excuse his own shortcomings by saying "The world is against me. Everybody is down on me, and won't let me get up." Instead of getting out and making a place for himself he preferred to lay on the banks of a creek, and read novels or shoot turtles and at marks for practice. Of course, he never had any training, but just drifted into this habit of living. His nature was a suspicious one, and he thought others were trying to rob him of the property which belonged to the old woman he lived with. This old woman married his grandfather, and is no blood connection of his. She is and always has been a terror, and it is no wonder that her protege is what he is. The neighbors tell horrible stories regarding the life of this old woman and young Powers, which seems incredible and unnatural, and until verified will not be published. The immediate cause of the shooting seems to date back a few weeks ago when Powers had been pounding his grandmother, and gave her a black eye. She sent for Jerome Tratebas, father of the murdered boy, to come and help her. He did so. The old woman told her story, which was overheard by Powers in an adjoining room. Tratebas advised her to have him arrested, and by that means she could get rid of him. She did not want to do that. So Tratebas went to Powers and talked to him, telling him if he could not live with the old woman without pounding her, he ought to go away and leave her in peace. Powers finally said: "Well, give me two hundred dollars and I'll go out. Tratebas said he nor the old woman had no money to give him. That he had not been raised by her, and was old enough to take care of himself, and was entitled to nothing. This ended that interview. A few days before the murder, John Tratebas and the two boys, Frank and Will, were going to the Powers house, where John's wife was, and just before entering, stopped outside to talk. Their conversation was about the sale of the mill property to Crocker Land Company, and in the conversation they talked over the proposed change in the dam which would increase the water power. Young Powers was hiding behind a tree near by, and probably heard the word "Power" used, and imagined that he was the subject of their conversation. The next day he jumped upon Will Tratebas, the first one of the trio he saw, and accused him of conspiring against him. The charge was so ridiculous that Will treated it lightly, but finally would have struck Powers, but that he saw a revolver in his coat pocket. The next day Powers renewed his attack, and in this, fired the fatal shots. Is Now Writing a Book. Murderer Powers would depopulate Chesterton could he have his own way. He is now yearning for the blood of the man who "writ that piece" about him in the TRIBUNE last week. Mr. Holmes can take a back seat for the Powers that is handy with his gun. He has written 300 pages of his life, and wants to put a book on the market. He thinks there would be lots of money in the scheme, and will do it if he can find a publisher. All that Powers ever did in this world can be put in a mighty small book. Obviously not an exemplary fellow, Alonzo Powers was apparently related to the Tratebas family, which was a well-known and highly respected family in the northern portion of Porter County. William R. Tratebas' great-grandparents, William and Ann (Armstrong) Thomas, were founders of Chesterton (William Thomas dying in Chesterton, then called Calumet, on September 27, 1838). William's uncle, William Vincent Tratebas, was the constable of Chesterton for many years. located in the Sanders-Tratebas plot of Section B in the cemetery. Source: Steven R. Shook, November 2002. ALONZO POWERS ON TRIAL FOR THE MURDER OF WILLIAM TRATEBAS. Many Witness for the State, and but Five for the Defense. Charles Lundquist, Martin Siegel, Daniel Shoemaker, J. P. Anderson, Daniel Linard, Henry Biege, Joseph Ireland, William Beahm, John Gress, Duncan Hunt, Christian Herrold, I. D. Phelps. The following witnesses were summoned by the State: Lenard Hill, David Osborn, Martin Young, William Finney, Chas. Sundine, Nelson Barnard, Richard Dodd, Maggie Stemper, Fred Parmateer, Geo. Brown, Allen Brown, Annie Reglien, Allen Barnard, Arthur Beck, Jerome Tratebas, Joseph Bavery, Ann Powers, Sarah Tratebas, Ben Little, Thos. Grady, Charlotte Travan, Lyman Schemer, Wilfred Trudell, Frank Tratebas, Lucy Cooley, Al Harper, Dr. Rubin, Lucie Reglien, C. J. Campbell, Frank Quick, Gust Sundine, F. G. Ketchum, Mrs. Maggie Stemper, Frank Tratebas, John Tratebas, Pauline Lawrence, Adolph Ellison, Chas. Stoner, Chas. Green, Emil Blatz, P. A. Johnson. Powers is represented by Judge Johnson and H. H. Loring, of Valparaiso, and E. E. Weir, of Laporte. Seated at the State's table are Prosecuting Attorney Heard and Judge Crumpacker, of Valparaiso, and Attorney John Richter, of Laporte. Mrs. Powers, of Chicago, and Mrs. Ann Powers, of this place, have seats near young Powers; while Mrs. Tratebas, wearing mourning weeds, and her husband, are seated to the left of Judge Crumpacker. The recital of the harrowing details has had its effect on the mother of the dead boy and she has cried piteously at intervals during the trial. Mrs. Powers has also been in tears. The same indifference which has characterized Powers since the morning of the tragedy was apparent when he took his place in the prisoner's dock. From the opening day of the trial he has maintained a stolid indifference as to the proceedings and it is doubtful if a sentence of death on the gallows would awaken him to the enormity of his crime or the seriousness of his position. Judge Crumpacker began his opening address to the jury at 3:30 Tuesday afternoon, speaking for upward of thirty minutes and graphically portraying the scenes which led to the taking of human life that memorable August morning. He was eloquent and forcible. The first witness was Lyman Shaner, who was then employed at Truedell's blacksmith shop, whose evidence was important to the State. He recited the quarrel between the two boys and characterized the killing as unprovoked. Powers, he said, deliberately drew his revolver and fired the fatal shot when Tratebas was standing several feet away, following the first shot with a second, which caused Tratebas to sink to the floor, death speedily ensuing. His testimony was not materially shaken by the cross examination conducted by Judge Johnson. Jerome Tratebas, father of the murdered boy, told of the character of the wounds and of the position of the body when found. Lizzie and Anna Reglien testified as to the quarrel the afternoon previous to the tragedy when Powers made threats that he would be revenged. George Brown, the officer who arrested Powers, said that the latter told him that the reason he fired the second shot was the belief that the first shot would not cause death. His evidence was damaging and was in the nature of a sensation. The blood-stained shirt and coat were then presented for examination by Dr. Ketchum, who described the course of the bullets, stating the either of them would have caused death. Wilfred Trudell, Richard Dodd, E. L. Harper, C. J. Campbell and Al Harper, all of whom were in or about the blacksmith shop the morning of Aug. 15th, recited the actions of the two men and giving convincing evidence as to the guilt of Powers. The cross examination failed to adduce facts favorable to the theory of the defense except possibly a few minor particulars. The state this morning showed by the evidence of John and Frank Tratebas that there were no conversation Monday night of the week of the tragedy, which would have caused the belief of Powers that a conspiracy existed to deprive him of his property rights. Constable Brown and Deputy Sheriff Green testified that there were no marks of violence on Power's face or body. The state showed by the evidence of Trudell that Tratebas had no weapons or wear any found on his person. The state rested at 10:30. Judge Johnston opened for the defense with a brief statement to the jury outlining the theory of self defense which will be offered. Powers took the stand at 11 o'clock. He was sharp and decided in his answers to the questions asked and was very much inclined to talk, adding a great deal to necessary answers. He told and gave illustrations of the positions and actions of himself and Tratebas at the time and just prior to the shooting without the least show of emotion. In a matter of fact way he gave the details of the crime. His mother and the mother of the deceased silently wept as he went on. He does not deny firing the shots but does claim that Tratebas was advancing toward him in a threatening manner when he drew the revolver and shot Tratebas down. In the cross examination of Powers, Judge Crumpacker held full sway and he brought in some telling questions which the witness made efforts to evade but it was useless. His attorneys kept Judge Hubbard busy acting upon objections. It was quite evident that Powers was as good a witness for the prosecution as for the defense. A little sister of the defendant, about 10 years old, was put on the stand but her evidence did not lend any important light to the case. The defense brought its evidence to a close at 2:45 o'clock Thursday afternoon and five minutes later Prosecutor Heard, or Porter county, took the floor and presented the argument. Judge Hubbard limited each side to 4 hours. Attorney Weir, for the defense followed and Judge Johnston ended the argument for the defense. The state has considerable rebuttal evidence to introduce, and the case will probably be given to the jury today. The general belief among those who have watched closely the daily trend of the proceedings is that the jury will agree to inflict the death penalty. Sentenced to Life Imprisonment for Murder. Laporte, Ind., Dec. 6. -- Special Telegram. -- The closing arguments in the trial of Alonzo Powers for murder were made this forenoon and the case was given to the jury shortly before 12 o'clock. No conclusion was reached until 9:30 tonight, when the jury returned a verdict of guilty of murder in the first degree, and gave the prisoner a life sentence. The crime for which Powers is to pay the penalty was committed at Chesterton, in Porter County, last June. He quarreled with his cousin, William Tratebas, over the division of some property, which resulted in his shooting and instantly killing Tratebas. the case was brought here on a change of venue, and its trial was commenced in the Circuit Court last Tuesday. 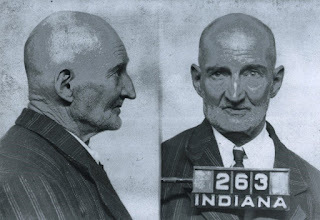 After his conviction of murder, Alonzo Leiben Powers was sent to serve his life term at the Indiana State Prison in Michigan City, Indiana. Photograph of Alonzo Leiben Powers, Inmate No. 263, 1895. Indiana State Prison, Michigan City, LaPorte County, Indiana. Source: Indiana State Archives, Inmate Records of the Indiana State Prison. Subject is a white man of 69 who was sentenced to prison at 25, in 1895, and was transferred to the IHIC in 1912. The crime of murder was committed in an argument that arose over what the brothers of the dead man were saying about our subject -- apparently hallucinations. The act was impulsive and was that of one who probably was insane at the time. Says that the girl with whom he was to marry wanted him for his money only, and that the reason why many inmates at the IHIC want him to marry their relatives is that they think he will get them out of the hospital. Had delusions about Alice Roosevelt and say he had the idea of marrying her for 3 years ever since he first saw her picture in the paper. Just why he gave her up is not clear. Has delusions of grandeur. Says he has a mental checkerboard on which he has all the kings and queens and diplomats and that he can determine just what move they are going to make. He can predict just what Hitler and Mussolini will do by consulting his mental checkerboard. Also claims to have special knowledge and ability that could have netted him a million dollars in the World War had he been released to give it to the government. Says he wrote the governor, president and other dignitaries but could not get in touch with them. Has delusions of persecution and insist that the deputy warden had him placed in the IHIC so that he would not be a disruptive and revolutionary element in the prison. He is not insane and was only as bad as others who made noise and were rambunctious. It was a clear case of "railroading him" to the "bughouse." Also has auditory hallucinations -- hears all sorts of uncomplimentary things being said about him, so much so that he stuffs his ears with plugs and at night shuts all windows and doors to keep them out. They molest him day and night and call him all sorts of uncomplimentary names. Throughout his interview he shows circumstantiality, and he is evasive. Frequently he refuses to discuss further some of the ideas that are clearly delusional for fear that something bad may happen to his schemes. He becomes irrelevant and goes off at a tangent. He is quite apathetic and shows no emotional reaction when discussing the delusions and hallucinations that disturb him so. This is quite characteristic of his condition. He is correctly oriented and his memory does not show any impairment. There is no notable impairment in his school and general knowledge, showing that the intellectual processes have not been affected to any great extent as yet. Physically he is in good condition and has a good number of years to live unless some vascular affident should make of him a physical or mental cripple. He is reported to be seclusive and at times noisy and disturbed, but makes a satisfactory adjustment on the whole. He is employed part of the time doing routine ward duties but obviously is not fit for any kind of work. He will need hospital care for many more years, at least until the changes due to old age and hardening of the arteries supervene. At that time he may become a case for mere custodial care. The mental changes have been very slow and long drawn out as he is today he is still very delusional and reacts to the delusions and hallucinations that he hears, and as much is a fit case for the IHIC or other mental hospital. ORIGINAL CRIME RESULTED FROM HIS MENTAL DISEASE. STILL ACTIVELY DELUSIONAL AND HALLUCINATING. I. I. Weiss, M. D.
The diagnosis of "dementia praecox, paranoid type" is more commonly referred to today as paranoid schizophrenia. At the time of diagnosis, dementia praecox was viewed as a progressively degenerating disease from which no one recovered. Therefore, it was highly unlikely that Alonzo was ever going to be paroled from prison. 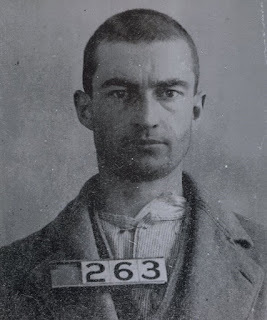 Photograph of Alonzo Leiben Powers, Inmate No. 263, October 16, 1933. After spending nearly 45 years behind prison walls, Alonzo passed away at the Indiana Hospital for Insane Criminals on October 24, 1939. He was buried in an unmarked grave at Greenwood Cemetery in Michigan City. We are still left wondering how Alonzo Powers was related to the man he murdered? Here's what can pieced together regarding the rather confusing connection between Alonzo and William, a connection that ultimately led to the murder of William. Anne Thomas (b. December 27, 1818; d. November 13, 1901), daughter of William and Ann (Armstrong) Thomas, married George Powers (b. September 6, 1810; d. February 14, 1888) on November 5, 1872. Anne's parents, William and Ann (Armstrong) Thomas, were pioneers of Chesterton. This was the third of three marriages for George Powers. George Powers’ first wife was Sarah Fulton Harbison (b. March 2, 1812; d. September 29, 1851), whom he married on May 4, 1837. George and Sarah had three children, one of whom was James Columbus Powers (b. January 4, 1845; d. 1881). James C. Powers married Mary Elizabeth Leiben (b. August 1849) on June 12, 1865. James and Mary were the parents of four children, one of whom was Alonzo Leiben Powers. Anne Thomas had a sister named Hannah Thomas (b. November 4, 1815; d. July 30, 1893). Hannah Thomas married Edmund Tratebas (b. March 21, 1815; d. January 4, 1851) on June 24, 1834, and they were the parents of six children, one of whom was Jerome Tratebas (b. November 18, 1836; d. March 1, 1907). 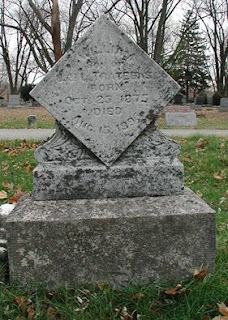 Jerome married Lorinda Harrington (b. November 18, 1836; d. April 18, 1924) on March 20, 1870, and they were the parents of three children, one of whom was William R. Tratebas (b. October 25, 1875; d. August 15, 1895). Thus, Alonzo L. Powers' step-grandmother was Anne (Thomas) Powers, while William R. Tratebas' grandmother Hannah (Thomas) Tratebas, was Anne's sister. As such, Alonzo L. Powers and William R. Tratebas were step-cousins. According to Marianne Hale, a descendant of the Powers line, at about 1881, Alonzo's father, James Columbus Powers, abandoned his family in Chicago. This left Mary Elizabeth (Leiben) Powers and her four children (Alonzo, LeRoy, Pearl, and Lizzie) on their own. Pearl Powers, Marianne's grandmother, had written that her father, James, had died in 1881, but he can be found in 1900, in San Francisco, with a whole new family. Alonzo's mother, Mary, had no means of support, and went into nursing (or more likely housekeeping) to provide for her family. Alonzo was sent to Chesterton, in Porter County, Indiana, to live with his grandfather, George Palmer Powers. George was living in Chesterton with his third wife, Anne (Thomas) Powers. It is believed that Anne (Thomas) Powers took out mortgages on her house to provide funds to pay for her step-grandson's (i.e., Alonzo L. Powers) attorneys during his murder trial. George Palmer Powers had already died in 1888, so there were only Anne and Alonzo in the old Thomas house (called the "Beehive") in Chesterton in 1895. The Beehive was located at the southwest corner of the present day intersection of Calumet Road and Morgan Avenue; note that at the time of the murder, Morgan avenue did not extend to Calumet Road from the west. It is thought that Alonzo believed that he was going to receive the real estate that Anne owned since he was her step-grandchild and had lived in her household. However, this transition in real estate probably was not the case, and blood relatives were likely to receive the real estate instead. This apparently caused some level of strife between Alonzo Powers and his step-grandmother's blood relations; namely William R. Tratebas. The Anne Powers' property was later sold to Anton R. Gustafson, who built a new residence on the property in 1904 and moved the Beehive home further back on the lot and converted it to a barn. Today, neither Gustafson's home nor the Beehive exist. The Lewis Publishing Company. 1912. History of Porter County, Indiana: A Narrative Account of its Historical Progress, its People and its Principal Interests. Volume I. Chciago, Illinois: The Lewis Publishing Company. 357 p. [see p. 339]. The Daily Inter Ocean, Chicago, Cook County, Illinois; August 16, 1895; Volume 24, Number 145, Page 5, Column 5. Column titled "May Be a Lynching in Indiana. People of Chesterton Aroused Over Will Tratebas' Murder." The Evening Argus, Owosso, Shiawassee County, Michigan; August 16, 1895; Volume 4, Number 23, Page 4, Column 1. Column titled "May Be a Lynching in Indiana." Chesterton Tribune, Chesterton, Porter County, Indiana; August 16, 1895; Volume 12, Number 19, Page 1, Columns 4 and 5. Column titled "A Terrible Affair. Wm. Tratebas Shot to Death." Bay City Times, Bay City, Bay County, Michigan; August 17, 1895. Volume 16, Number 193, Page 1, Column 1. Column titled "Popular Young Man Shot Down in a Quarrel Over a Division of Property." Chesterton Tribune, Chesterton, Porter County, Indiana; August 23, 1895; Volume 12, Number 20, Page 1, Columns 2 and 3. Column titled "Later Developments in the History of the Powers Affair. Bound Over to Court." The Daily Inter Ocean, Chicago, Cook County, Illinois; October 25, 1895; Volume 24, Number 215, Page 1, Column 6. Column titled "Two Chicagoans are Indicted. Alonzo Powers for Murder and Alice Martin for Shoplifting." Chesterton Tribune, Chesterton, Porter County, Indiana; December 6, 1895; Volume 12, Number 34, Page 1, Column 4. Column titled "Alonzo Powers on Trial for the Murder of William Tratebas: Many Witnesses for the State, and but Five for the Defense." The Daily Inter Ocean, Chicago, Cook County, Illinois; December 7, 1895; Volume 24, Number 258, Page 3, Column 4. Column titled "Alonzo Powers Found Guilty. Sentenced to Life Imprisonment for Murder." The Chesterton Tribune, Chesterton, Porter County, Indiana; September 13, 1901; Volume 18, Number 23, Page 5, Column 5. Column titled "Chesterton Chips." The Chesterton Tribune, Chesterton, Porter County, Indiana; November 15, 1901; Volume 18, Number 32, Page 5, Column 6. The Chesterton Tribune, Chesterton, Porter County, Indiana; November 22, 1901; Volume 18, Number 33, Page 5, Column 5. Column titled "Chesterton Chips." The Chesterton Tribune, Chesterton, Porter County, Indiana; November 20, 1903; Volume 20, Number 23, Page 5, Column 4. Column titled "Chesterton Chips." The Chesterton Tribune, Chesterton, Porter County, Indiana; July 1, 1904; Volume 21, Number 13, Page 7, Column 7. Column titled "Chesterton Chips." The Chesterton Tribune, Chesterton, Porter County, Indiana; October 26, 1939; Volume 56, Number 30, Page 1, Column 7. Column titled "Death of Convict Recalls Chesterton Murder of '95." Indiana State Prison, Indiana Hospital for Insane Criminals. 1939 (April 7). Powers, Alonzo, No. 263 (IHIC), Psychiatric Report. Indianapolis, Indiana: Indiana State Archives. Marianne Hale, personal communication, January 2008.